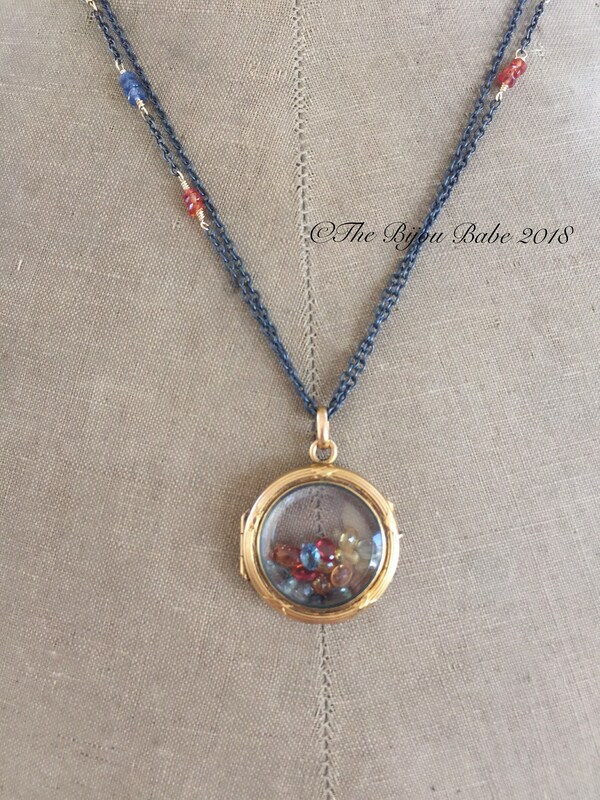 A gorgeous, antique locket from France, (hallmarked with maker's name), with original glass on both front and back, has been filled with sparkling oval sapphires in multiple shades. Colors used are blue, orange, sage green, and yellow. The sapphires "float"beneath the glass, so they shift in position. Some history about this special locket: In the early 19th century, a young Parisian jeweler invented a process of applying a thick layer of 18kt or 14kt gold foil over brass to create jewelry that mimicked solid gold. The process was so good that the pieces done using this technique are often mistaken for solid gold. In addition, due to the thick layer of gold used, the pieces have withstood the test of time. I have had the good fortune to acquire several of these types of lockets, (a few I've kept for my personal collection!) and they hardly ever show signs of wear to the metal surface. This locket's frame has the lovely, traditional Louis XVI "ribbon and reed" motif, so very French! The glass is original, has a beveled edge, and has some minor scratches on the glass. They are barely noticeable, and do not detract at all from the beauty of the piece. Please do be aware that the panels are glass, and will break or crack if care is not taken. To make the piece wearable for this century, I've chosen to suspend it from two cable chains of oxidized sterling silver. The contrast between the gold tone of the locket and that of the oxidized silver chains looks striking. The chain is embellished with hand wired sapphires in three different shades: blue, orange and a steel blue/green. 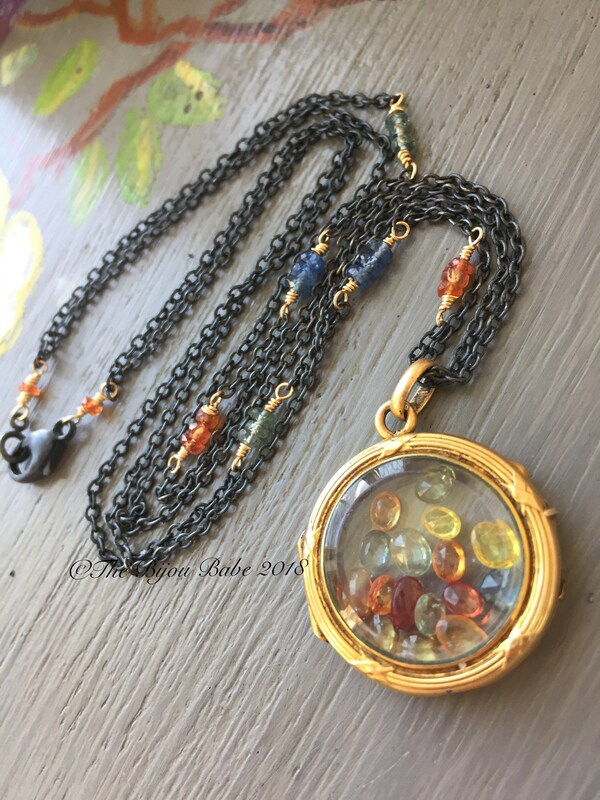 I've used 14kt gold fill metal to provide contrast with the oxidized silver chain, and to complement the gold color of the locket. 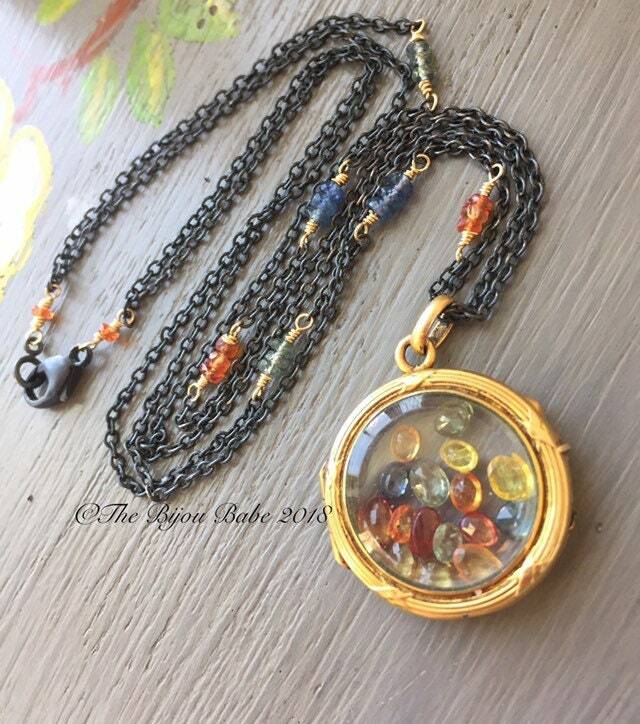 If you love jewelry with history and one of a kind pieces, this is a wonderful locket to add to your collection. It is now completely wearable for the modern woman! 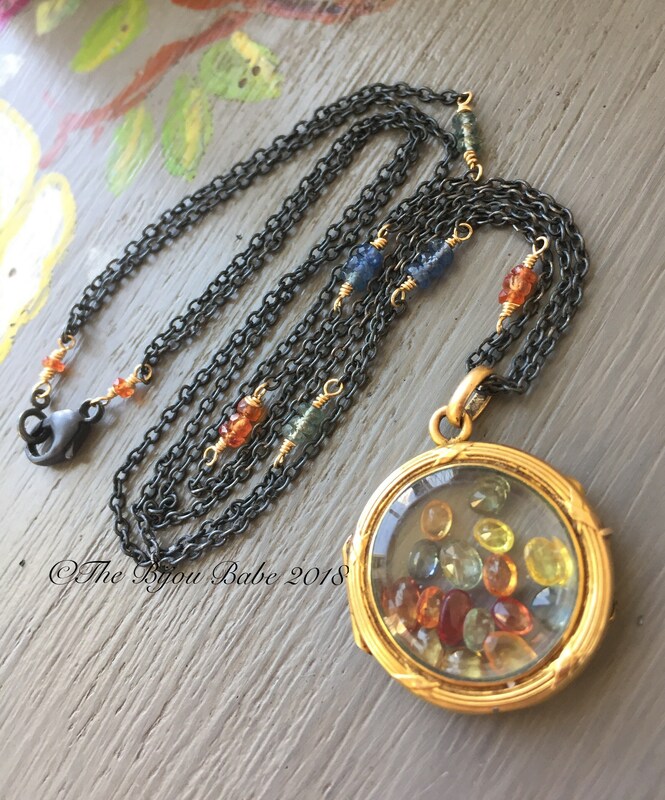 Each of the lockets I carry in my shop have been selected for their originality, beauty and history, and I source them from some of my favorite antique dealers whom I trust. Similarly, the gemstones I source come from a couple of different reputable dealers, and they are of gem quality that will not disappoint. 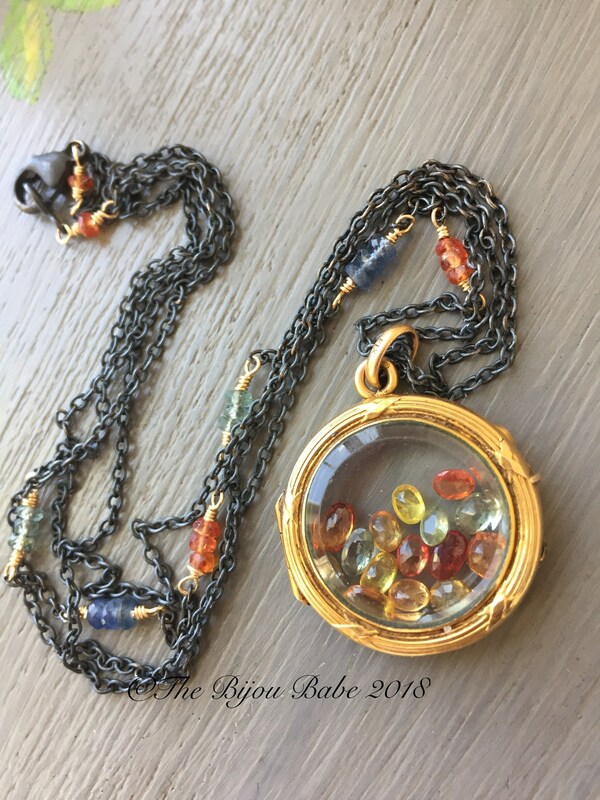 I've been creating jewelry for over a decade, and have a particular passion for using antique and vintage pieces in my work! Please read my feedback of 600+ happy clients, and contact me if you have any special requests. Your "Harvest Moon" locket will ship USPS Priority Mail with tracking in the US, and will be packaged in a lovely gift box tied with ribbon.